After being born in London, England. At an early age, he realised that the urban landscape and the modern ideas of ‘productivity’ were truly unsustainable and in many cases suicidal. With a naturally and deeply-installed sense of respect for Nature, Ras decided to study all that he could about Sustainable living and Permaculture. After studying Garden Design and Organic Management with the ‘City and Guilds’ program in London, he became a resident at the Center for Alternative Technology in Wales. There he completed courses in various subjects; ‘Solar Hot Water systems’, ‘Alternative Building Techniques’, ‘Timber frame self-build’, ‘Compost toilets and sewage systems’, ‘Organic pest control’, ‘Solar electricity’, and ‘ Live willow weaving’ to mention a few. Amongst the times between these courses he was volunteering in the vegetable garden at the centre, helping out with the rest of the crew assigned to on-site food production. Ras managed to help start one of the first hydroponic systems in one of the greenhouses, with the plants growing completely from nutrients from human waste. The next step in his studies was to move to Australia to study Permaculture. 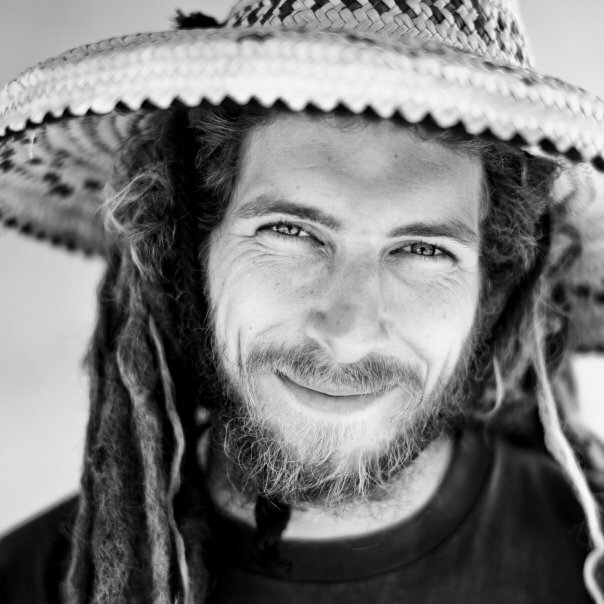 After meeting some people from the first Permaculture village in Australia (the home of the term ‘Permaculture’) Ras decided to start his studies in this direction by taking part in a Permaculture Design Course (PDC) at Crystal Waters in Queensland. He expresses that ‘it was a great place to study as there were so many examples in action, that one could see in effect, for all the different theories and concepts that we were soaking up in the classroom’. After completing the ‘PDC’, more than fifteen years ago, Ras became a member of WWOOF. which stands for – ‘World Wide Opportunities on Organic Farms’. It is a network of organic farms worldwide that take people in to work with them, in exchange for a room and three meals a day. He volunteered on a number of different farms in a sub tropical region of Eastern Australia, learning through practice and hands on experience how others were living sustainably. Eventually Ras found his own 5 acre permaculture farm on the edge of a ‘world heritage’ rain-forest where he practiced his Permaculture knowledge, working with the local environment. And where he had his first oppurtunity to take on ‘Wwoofer’ volunteers onto his own farm, being now in the opposite role of a ‘Wwoof Host’. Ras John Specializes in ‘Pattern understanding’ of Permaculture to a very deep level, which is a topic often over-looked or rushed-over by many teachers. He likes to study complex Mathematics, Physics and Geometry of the natural world, and turn it into a very easy to understand and digestible subject. His knowledge of indigenous and ancient living wisdom, together with a long term practice in Shamanism, helps him to express the hidden mysteries of suppressed cultures and bring history and her-story to life. Turning hard to understand concepts into easily usable and practical activities and design that we can use in our every day lives. After Going back to being a volunteer on other peoples farms in southern spain for almost three years, he finally settled on a patch that he could call home. Ras now runs a small permaculture project in The Alpujarras, Where he grows a huge mix of plants, bushes, trees and climbers to create a well balanced garden. He tries to put into effect all the things which he has learnt along the way,And at the same time is learning how to adapt to this Mediterranean environment. the project experiments with sustainable structures…. solar cooking…. composting……. energy production…. And now Ras and his partners are getting enough knowledge together to feel the need to share it with others through workshops, courses, videos, etc . =Design consultancy service and helping others such as Clients, Students, Interns, and Apprentices with their design processes especially mapping contours .